Their full trailer looks sooo good. I never expected that much adventure or romance. These robots have such personality. Oh man, that looks great! I'm looking forward to loving Pixar again. Damn. Gotta admit, I didn't think they could do much with the concept when I first saw the original trailer... but this looks amazing! I guess it was wrong of me to doubt these guys. Same thing happened with Ratatouille. lol. 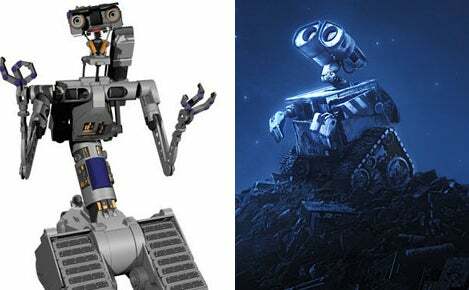 I myself was hoping the story would be about WALL·E teaming with Steve Guttenburg and growing up to become the next "Johnny Five", but Pixar is always full of surprises. thanks for the link. I had not seen the whole thing yet. Oh YES, that looks like the Pixar I remember. Personally, I didn't think Cars or Ratatouille were among Pixar's best work, but this looks sweet. This looks SO GOOD. I want to see this and Kung Fu Panda. I have a really strong feeling that this is going to be one of Pixar's best. Looking forward to losing myself in this film. There are people who didn't like Ratatouille?!? Yeesh, what does it take to please you people? Check out my comics and stuff at Phantasmic Tales. Yeah, I saw this a couple of days ago, looks amazing... Could become one of Pixar's best... It's got the crazy, crazy plot with the love aspect that always needs to be in a Pixar movie in one way or another. Kazu wrote: Oh man, that looks great! I'm looking forward to loving Pixar again. Ain't that the truth! The CGI quality alone has me excited for WALL-E, let alone the whimsical sounding story and robots. I just showed this to my wife, she said that I don't have to drag her to movie now, she'll go willingly. I'm pretty sure that's all I need to say right now. That, and go see WALL-E, like, right now. Seriously, go, I'll wait. Harry Myland (IV) wrote: Best Pixar movie ever? Saw it last night at 7:30pm, I don't even want to discuss it until people get back from seeing it themselves because of risk of spoiling things, but it's as I hoped, there's probably no more than 30 minutes of dialog, (which makes all the little kids ask some questions in the middle of the movie when it gets to the particularly deep subject matter)! Needless to say, the subject matter was not what I was expecting at all, and I spent the whole movie just awestruck thinking to myself "I can't believe Pixar just did that!" Now, everybody go see it! ^_^ Evidently though, based on the style of Eve and the opening Pixar cartoon, the staff have been playing too much Portal.